I’m using a 3 and I’ve tied both with a slip knot, I could do the same carry with a 2 if I tied with a square knot or a 4 for longer tails. I thought FRTR would be a good follow up to semi FWCC because they are really similar, but with one main difference, and that difference can teach us about terminology. A note on terminology, both these carries have one horizontal pass (a pass that goes under one of your arms, across the baby tucked under baby’s bum for a seat and then under the your other arm). however, Semi FWCC has one cross pass (over your shoulder, diagonally across the baby, under/between the baby’s leg, and then under your other arm) where FRTR has a rebozo pass (over your shoulder, diagonally across the baby and then under your other arm). 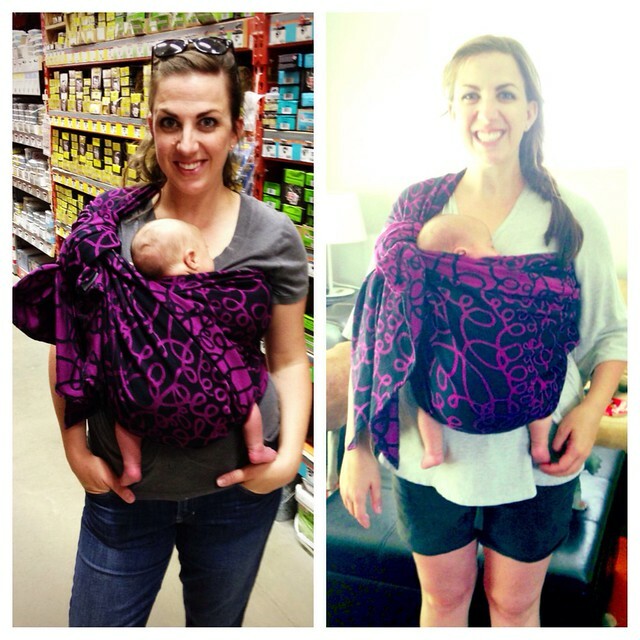 A rebozo pass does not go under the baby’s leg, instead it forms a sort of hammock that baby sits in.